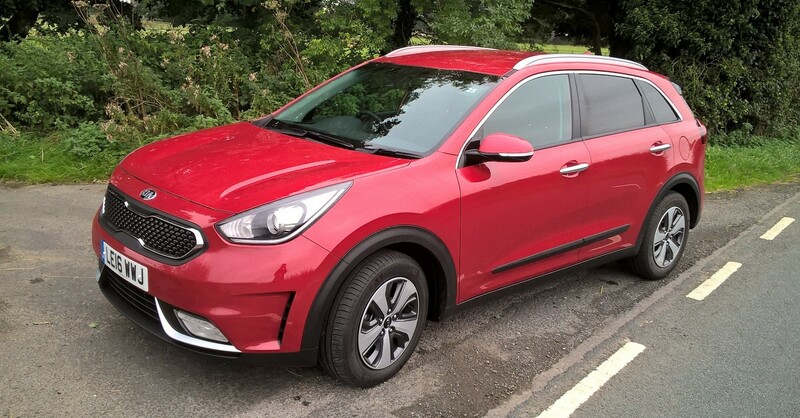 Kia introduces the “all-new Niro”- was there an old one, then? 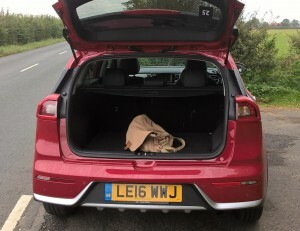 On first appearances, it looks like the designer’s brief was changed mid-project by senior management as it looks indefinable within the ambiguously-named ‘crossover’ market as well as being embellished somewhat with a hybrid powertrain just to confuse its genre more. Only available with a 1580cc petrol engine; on idle, it is almost indetectably silent although the unit sounds hoarse on kick-down through the twin-clutch transmission. The trip computer on our ‘2’ model with sixteen inch alloy wheels advertises 55 mpg with a range of 500 miles over 45 litres and surprisingly, there appears to be none of that dead weighting over the rear axle that can make you feel queasy particularly when going over speedbumps despite a 1.56-kWh lithium-ion polymer battery with a mass of thirty three kilograms located under the rear seat. With 88g/km of carbon dioxide emissions, it falls well below the 100g/km threshold at which cars are then charged UK road tax. Available also with eighteen inch alloy wheels, the latter will reduce your fuel consumption by 10.1 mpg according to Kia official figures – bling costs. 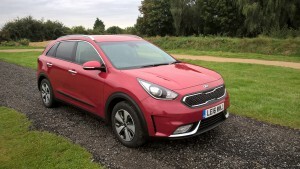 The Niro’s electrically-assisted steering feels inert as there feels like five degrees of ambiguity around the straight ahead position of the steering wheel and ergonomically, there are some dark, hard plastics so often the trait of far-eastern manufacturers, with a narrow rear window and tiny wiper. So, after a short test drive, what are my impressions of the Niro? Although not a driver’s car, it targets practicality and eco-friendliness as its main priorities but I wouldn’t say that the time spent with it was a memorable one. The market isn’t exactly crying out for hybrid crossovers which makes it a bit redundant but it’s cheap at a starting price of £21295.